Outstations and central network can be connected via VPN. Ebenfalls ist es möglich transparente VPN-Verbindungen zur Übertragung eines Layer 2 Netzes aufzubauen, um so flache Netzstrukturen beizubehalten und trotzdem sicher das öffentliche Netz verwenden zu können. Secure connections between your outstations and your control centre can be established using VPN. 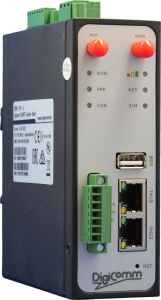 The DSR-211-N Net-2-Net router is used for monitoring water, gas and electricity networks as well as for securely transmitting data for POS terminals and ATMs, video and media transmission (digital signals) and the remote maintenance of vending machines and other industrial machines, plants and equipment. Ethernet-based systems can be connected to the Internet quickly and easily due to integrated ethernet interfaces. The DSR-211-N router is also fitted with a RS-232 port. This interface can be used to connect serial devices as a modem or VirtualCOM port,dial modem and PTB-time server. The requirements of DIN-27001 for critical infrastructures are integrated into all products of the DSR-200 series.